The City of Toronto has completed a Project File Update to the 2015 Albion Sanitary Trunk Sewer Rehabilitation Municipal Class Environmental Assessment (EA) study. The Project File Update includes a review of the planning and design process of the 2015 Class EA study and documents the re-evaluation of options and the recommended changes to the preferred solution for Areas B and E within the study area. The Albion Sanitary Trunk Sewer (STS) is a 3 kilometre long, 750 mm diameter, trunk sewer that was constructed in 1960s. The Albion STS runs adjacent to the Humber STS through the Humber River Valley and the two sewers cross one another at a number of locations (see study area map). Abandonment of a few sections of the Albion STS that are inaccessible and/or cannot be maintained due to low flow conditions. Rehabilitation of a few sections of the Albion STS that will remain in operation due to local sanitary sewer connections. 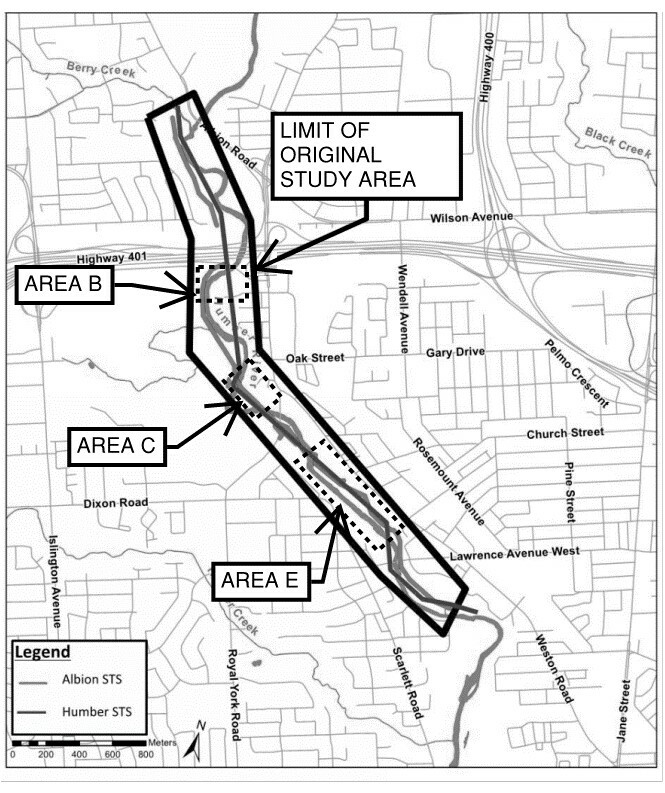 Area B in the Study Area – Construction of a new sewer as per Option 1 in the Project File Update Report instead of tunnelling under the Humber River. Area E in the Study Area – Construction of a new sewer instead of rehabilitating the Albion STS from Manholes 11 to 13A and Manholes 14 to 15.